In 2013, the National Weather Service designated Emory as Georgia's first StormReady University. As Georgia observes Severe Weather Preparedness Week, Feb. 2-6, members of the Emory community are urged to review campus emergency plans and be sure to know what to do in case of disasters. “Knowledge empowers people. If you think through what to do in advance, you'll be better prepared to take care of yourself and those around you until you can get help,” says Sam Shartar, senior administrator for Emory’s Office of Critical Event Preparedness and Response (CEPAR). Emory’s new RAVE emergency communications system, rolled out in November 2014, enables the university to send multiple modes of emergency notifications quickly and efficiently. Notifications include text messages, email, outdoor sirens, social media, RSS messages to webpages, and cable messages directly to Emory Cable Television. To be prepared in case disaster strikes, Shartar urges members of the campus community to take the pre-emptive step of programming two "short codes" into their list of cell phone contacts — 226787 and 678283 — accompanied by unique ringtones, so that recipients will be able to quickly identify Emory emergency alerts. Georgia’s Severe Weather Preparedness Week focuses on a different topic each day, including family preparedness and purchasing a NOAA weather radio, thunderstorm safety, tornado safety, lightning safety and flood safety. “Weather in Georgia can be very unpredictable, and our residents have to be ready for everything from tornadoes to ice storms,” Jim Butterworth, director of the Georgia Emergency Management Agency/Homeland Security, says in a press release announcing the week. Emory joins state officials in encouraging people to prepare for disasters before they strike. “Understanding risks, being aware and dedicating time to prepare for emergencies makes you disaster resilient and can save lives," Shartar says. Look for the Severe Weather Refuge logo to identify where you can shelter on campus in case of a tornado or dangerous winds. In 2013, the National Weather Service designated Emory as Georgia's first StormReady University, a distinction earned by developing proactive plans to better prepare Emory’s campuses for severe weather events. Severe weather is probably the greatest threat faced on the Emory campus; tornadoes can occur year-round in Georgia, with peak periods expected in early spring months, Shartar says. Knowing what to do in the event of a tornado warning or dangerous winds, being aware of where shelters are located on campus, reviewing CEPAR's online resources, and downloading a weather app — some are free — to your smartphone are all steps that anyone can take now, he adds. If you are indoors, move to a Severe Weather Refuge location on campus, or the lowest level of a building in an interior room or hallway, away from windows. 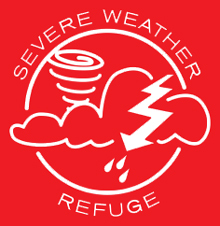 The locations are marked with the Severe Weather Refuge logo. If you are outside, seek shelter immediately on the lowest floor of a sturdy nearby building away from windows. If no shelter is available, lie flat in a nearby ditch or depression and cover your head with your hands. Flying debris causes most fatalities and injuries associated with a tornado. If you are in a vehicle, which offers little protection, go to the lowest floor of a sturdy nearby building, away from windows or lie flat in a nearby ditch or depression and cover your head with your hands. Be aware of falling debris and power line hazards. While less common than tornadoes or severe thunderstorms, ice and snow events can also have a serious impact in the Atlanta area — as last year’s ice event, dubbed “Snowpocalypse” in the media for its crippling effect on area roadways, showed. Stay dry; wet clothing speeds the loss of body heat. Stay covered; use mittens or gloves and a hat to prevent heat loss. Dress in layers; air trapped between loose layers helps to insulate your body. In addition to the risk that extreme cold brings to people and animals, cold temperatures can also cause problems with frozen pipes that may lead to the loss of water pressure and ruptured pipes. Do not attempt to correct the problem on your own. In the event of a major utility failure or potential danger to building occupants, immediately notify Emory Police by dialing 911 from any campus phone or 404-727-6111. Call Campus Services during regular business hours (8 a.m. to 5 p.m.) at 404-727-7463. "Just in Time" Guide to Campus Emergencies, for both Atlanta and Oxford campuses. Emory's Emergency Notification Program, which promotes options in signing up to receive weather or law enforcement emergency alerts via email, text messaging, Twitter or Facebook. Preparedness Checklist, which provides handy reminders for advance actions to take and numbers that can be called in the event of an emergency or campus accident. "Run, Hide, Fight" video, which offers safety tips on what to do in the event of an active shooter in the workplace or classroom. In addition, there are simple steps individuals can take now that will pay off when severe weather or unexpected emergencies occur in the future, Shartar says. Enroll or update your personal contact information in Emory's Emergency Notification Program. Program the emergency numbers for the Emory (404-727-6111) or Oxford (770-784-8377) police departments into your cellphone. Enter an "In Case of Emergency" number into your personal cellphone. Establish a personal communication plan. Do friends and family know how to contact you in the event of an emergency? Know how to exit your building if the primary pathway/door is blocked. Follow campus signage to locate shelters, in the event of severe weather or tornados. Know how to readily access Emory emergency contact numbers. Consider taking a basic first aid or CPR class. Your ability to respond in a crisis could help those around you.